...... Embedded professional features like Psychovisual Modeling and Source Preprocessing, cut time and costs while improving on the performance and quality you expect from DivX encoding. The Psychovisual Modeling feature exploits the peculiarities of the human eye to enhance fine details of complex visual scenes without increasing file size, while Source Preprocessing automatically cleans source video to enable better compression and higher visual quality. 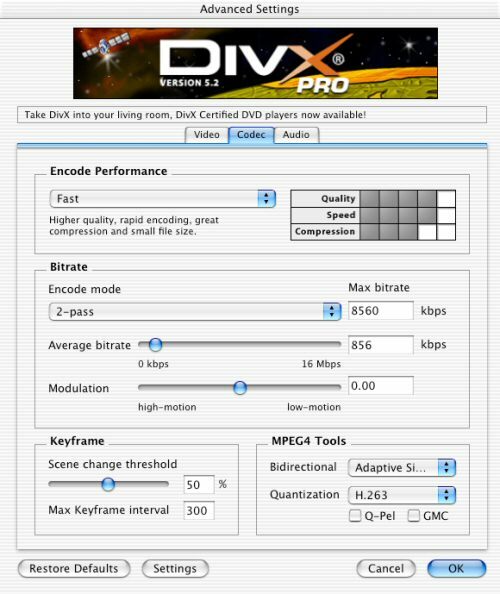 The DivX Pro Mac codec also includes built-in support for DivX Certified encoding profiles, allowing the creation of high-quality DivX video for playback on DivX Certified consumer electronics devices. The added features of the DivX Pro codec allow it to create video that's 30% smaller than video created with the DivX codec. The DivX Pro codec compresses raw video to one-hundredth of its original size, creating files 20 times smaller than MPEG-1 and 10 times smaller than MPEG-2 (DVD), all without sacrificing visual quality. Qweas is providing links to DivX Pro Video Bundle for Mac OSX 5.2 as a courtesy, and makes no representations regarding DivX Pro Video Bundle for Mac OSX or any other applications or any information related thereto. Any questions, complaints or claims regarding this application DivX Pro Video Bundle for Mac OSX 5.2 must be directed to the appropriate software vendor. You may click the publisher link of DivX Pro Video Bundle for Mac OSX on the top of this page to get more details about the vendor.